Amber loves languages, as many of you that have read the blog for any length of time know. She can't get enough of word etymology either. This is why we were both so excited to be selected to review Greek Morphemes Lessons (It's NOT Greek to Me!) from Ready to Teach. I'll just say right up front: this vocabulary program did not disappoint! For the review we received the Student Book, Instructor's Manual along with its CD, and the new flash drive that replaces the CD content. To keep up with changing technology, Ready to Teach is now sending the needed PowerPoint files only on the flash drive. While we have the ability to use both CD and flash drives, the portability of the flash drive was much appreciated. First, let me tell you a little about how these vocabulary studies work. As you might gather from the title, Greek Morphemes Lessons (It's NOT Greek to Me! ), is a vocabulary program based on the study of Greek roots, prefixes, and suffixes geared for 7th through 12th grade students. It can be an entirely independent program where the student reviews the PowerPoint lessons prior to the book work or a parent / teacher can use those same instruction files to guide the student. There are twelve lessons contained in the vocabulary program and a suggested pacing of roughly one lesson per week. Along with review time, a mid course test, and final test this brings the entire course to approximately 14 weeks to complete. Each week is structured in the same manner which allows the student to know the daily expectations without a constant reminder. Over the course of a week the student will learn the meaning of a set of Greek roots, prefixes, and suffixes; define a list words based on their new knowledge and then check that definition; write sentences with context clues as to the meaning of their vocabulary words; create new words using the morphemes learned; and review by applying what they have learned to a new set of words. The student also creates study cards of the new morphemes learned each week from color pages provided in the student book. These cards make it easy to quickly glance through the learned morphemes and keep their meanings fresh as well as supplying the tactile need of some students to write out what they have learned. The lessons also have a test scheduled for the last day of the week. The tests use word lists that need to be "worked" much like the assignments, only the student does not look up the definition in the end but stops with their own definition. These are extremely portable lessons. Amber regularly takes them to her doctor's appointments. With the iPad dictionary apps we only need the workbook and an iPad to complete an entire lesson. Right away Amber and I were both pleased to note the instruction and review lesson files are in the easily accessible PowerPoint format. This means there is not a proprietary program that needs to be installed on a computer prior to use. It is also a format usable on tablets, specifically our iPads! The actual Microsoft PowerPoint software is not needed either. We use free open source office software in our home. I won't get into the differences in those products, except to say that Amber has one software set while I have switched to another and in both cases the PowerPoint lessons ran without a hitch. We did install the free Microsoft PowerPoint App on my iPad and have been equally happy with those results. In fact the majority of Amber's lesson time has been completed on the iPad. We are so thankful the Greek Morphemes Lessons are portable and Amber isn't tied to her computer. Amber's first question about the lesson files was if they ran on their own, like a video. She was pleased to note she could advance them forward at her own speed. She often has trouble with video lessons going faster than she would like, especially when notes or workbook pages need to be completed while watching. Amber also commented, "There's no possible way I could get bored or daze out. I have to keep making the lesson go forward." In her mind this is a huge positive since she has to work hard to stay focused during video lessons. We chose not to use the tests included with each lesson since the nature of Amber's condition (dysautonomia) makes memory recall quite difficult on random days. We also did not make the vocabulary cards for a similar reason. Amber has a near photographic memory when her memory works, which makes study cards of this type unnecessary. In our homeschool we are all about conserving Amber's precious energy, thus our ongoing goal is to reduce school work and assignments to only those which actively contribute to Amber's learning success. 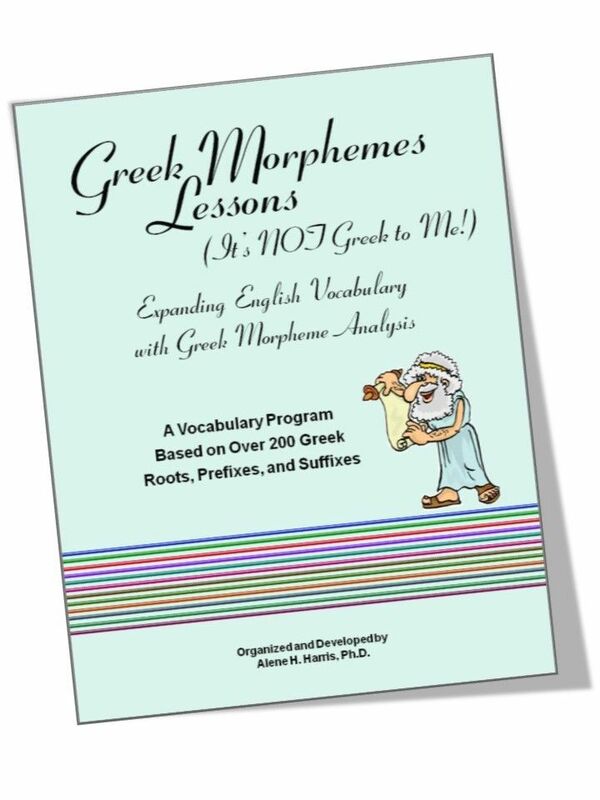 Greek Morphemes Lessons is extremely adaptable without losing effectiveness. Computer or iPad? The lessons work the same! Amber absolutely, unreservedly loves this vocabulary program. She finds learning word roots interesting and an easy way to remember new word definitions. She doesn't even mind searching for the actual dictionary definitions as part of her assignments, which to her is just verification of how easy it is to deduce the word meanings. I am thrilled she is doing more dictionary work, however I am most excited about the context sentence assignments. Amber already was fairly decent at deducing definitions of unknown words from context clues, but this is taking her skill to a whole new level. We've already seen improvements during our literature study discussions. Amber's favorite part of the whole program is definitely creating her own words from the morphemes. She is now creating words on her own even when she's not completing an assignment. Though sometimes her invented words turn out to be actual words listed in the dictionary, like the "cacophony" incident. After a recent symphony performance, trying to be smart about her morphemes, Amber says "If phon is sound and caco is bad, wouldn't cacophony be bad sound?" Amber was greatly miffed when I explained it did indeed mean something similar to that. Oh, the fun we have had with these morphemes. Amber has taken to heart the morphemes lesson which taught that any word can be a "real" word if enough people use it. I might need to take this course too so that I can understand my child. The It's NOT Greek to Me! program has been such a wild success in our house that we decided to set aside poetry for the remainder of this semester in order to complete the entire book. Amber and I both highly recommend this vocabulary program for all middle school and high school students.